Mike Simpson’s early career as an artist attracted recognition through his accurate, highly detailed pencil sketches of the contemporary working cowboy. In the 70’s, with encouragement from Ed Runci (a former Coca Cola girl illustrator turned professional oil painter), Mike began to work in oils. His subjects also changed, enlarging to landscape, particularly that of the cowboy-in-context. During this period, Mike had further help from Joe Beeler, founding member of the Cowboy Artists of America. Mike is no stranger to the West and it’s lifestyle. From cowboying on one of the west’s largest ranches, horse back packing in the Rockies, being a lease agent on the Crow Indian Reservation, to running sled dogs in the Colorado high country in the winter. Mike not only lives in the West, Mike lives the West, and that is what he paints, the West. When not in his gallery/studio, Mike can usually be found out painting on location, gathering reference material for future paintings or merely “living the West”. “Using watercolors for their transparency and loose suggestive qualities or oil paints for their opacity, texture and quality of brush stroke, I paint the people, places and things of small town, rural America. From the towering peaks of the Rocky Mountains, to the towering grain silos of Kansas or the small adobe casas of New Mexico, to the fishing boats in a marina on the Northern California coast, the cowboys of Montana, the bewhiskered bikers of Sturgis or the girls on the corner in Winslow, Arizona, they all have a story. 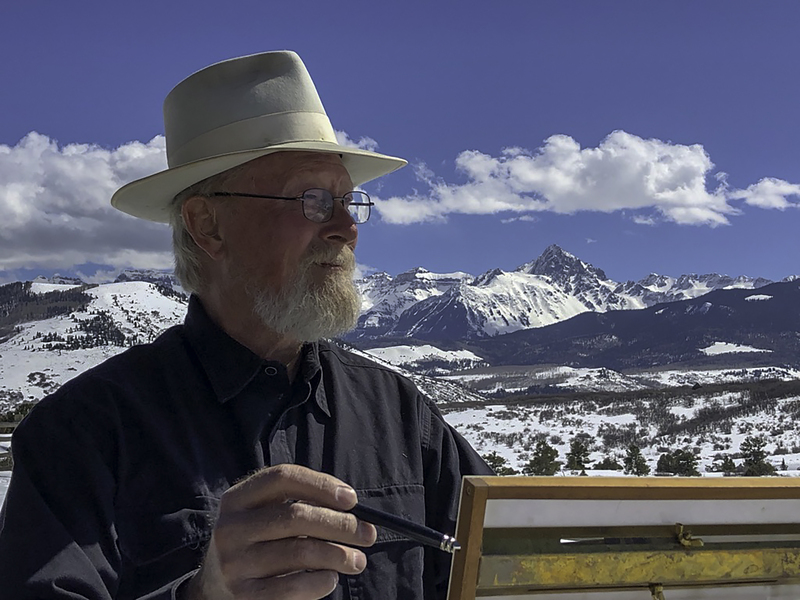 Mike is a signature artist of Western Colorado Watercolor Society, Plain Air Painters Colorado, New Mexico Plain Air Painters, and a member of the National Watercolor Society, Oil Painters of America, and The American Impressionists Society.